Heidi Neilson, Michael Rahn, Jewel Shaw. May 1 2015 - May 31 2015. 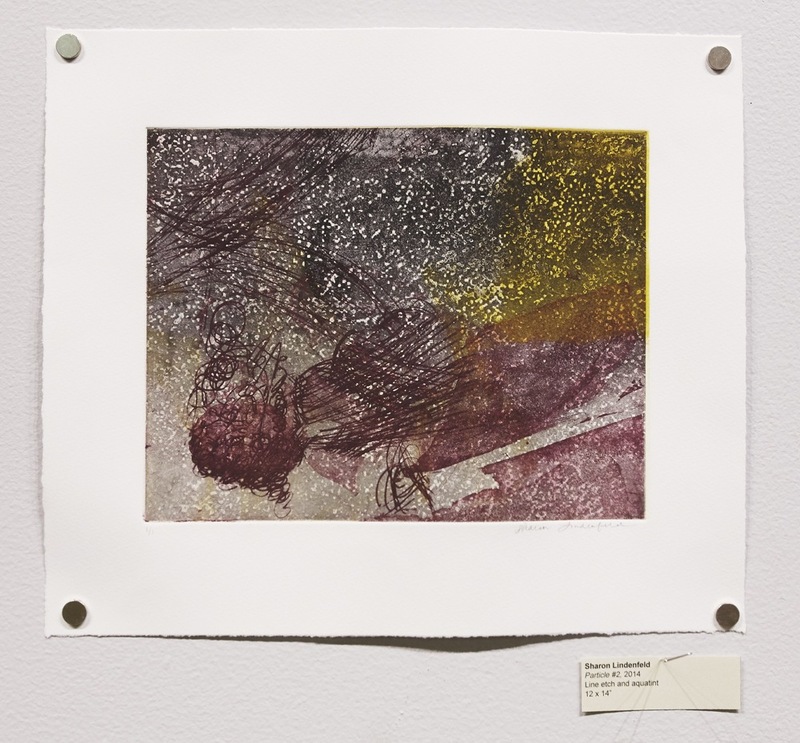 Six Artists Etching, May 1 - 31, 2015. Animation and installation of drypoint, mess-o-tint and etching. Dimensions variable; unique. Etching, digital printing, chine-collée. 18" x24". Etching, aquatint and chine collée. 18 x 24” (image) / 22 x 30 (paper). There is a unique physicality to intaglio, the print medium encompassing etching, engraving, mezzotint, drypoint and related techniques. Images are incised into surfaces which provide the template for the production and possible reproduction of a work. These mediums require the use of highly specialized tools and machines that are often very cumbersome, collaborative processes, labor-intensive techniques, and the use of metals, corrosive chemicals, and heavy machinery. The physical requirements of the medium generates work that possesses a distinct power and resonance. In a peculiar way these works contain and convey a record of the process, and of memory, history, and time. With a unique intimacy and immediacy a line is drawn from the viewer, through the materials and means, back to the artist themselves. The members of Shoestring Press and the community gather to learn, share, and make through creative processes and the work of art-work. The labor that goes into the shop, and what its different tools and techniques ask of its member/makers are recorded as the whole body of artwork produced. Thus, the output of the shop represents and reflects the community; elucidating the symbiotic relationship between individual artist and their tools, materials, processes, and environment. 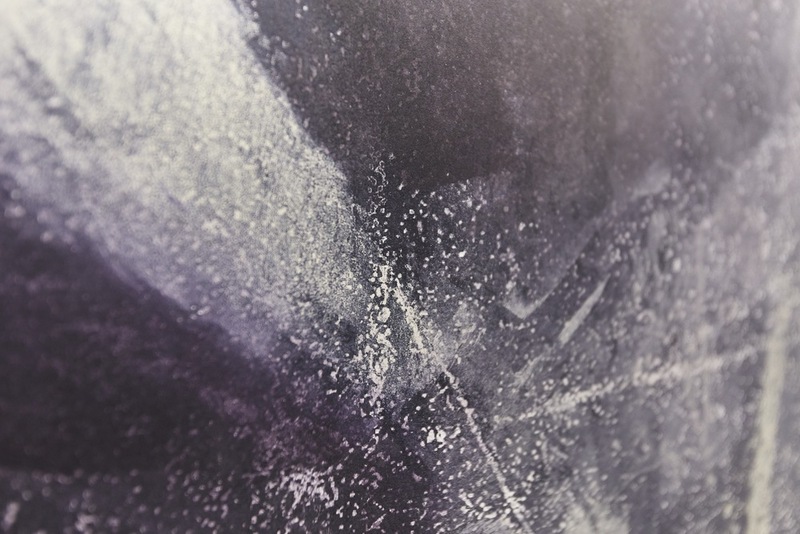 Etching is an anachronistic choice of medium for Madeleine Boucher’s Deux ou Trois Choses (Redux), a narrative durational work consisting of both animation and print images. It represents a deliberate choice to eschew the myriad technologies available to tell a story and to choose instead an unwieldy medium that resists the artist’s attempts to control it. Made with frames printed from a single copper plate, the animation traces the physical breakdown of the plate over the process of altering the etched image, resulting less in a video work than a still image brought to life. One cannot help but attend to and marvel at the very making of the work. With a nod to Marshall McLuhan’s famous remark, the message in this work is largely the medium itself. The story-book sized panels of Emily Noelle Lambert have a charm and whimsy that belies the subtle narratives implied by the action of the characters and dynamics of their environment. Lambert modelled the flora in these works after hangings and overgrowth in the dense urban landscapes of India. In the foreground, suggestions of patches of land, sea, and architectural forms, and playfully rendered flowers and trees invite the viewer into a world brimming with energy, vegetation, and dense with layers of arabesque, curling, winding, and undulating lines. She conveys a palpable sense of wind, rains, and other elements to create expressive atmospheres. On an intimate scale, her images possess a visual immediacy and suggestions of pithy narrative while at once vigorous, dynamic, and ambiguous. Sharon Lindenfeld’s vast dreamscapes begin with photography. These images are manipulated before being imposed on an etching plate made especially for this body of work. Earning a grant to produce the tools necessary to create this work, Lindenfeld’s vision necessitated the creation of new tools and techniques. She and her collaborators built a large etching bath, enabling her to make work at a different sizes and scales. The resulting inchoate dreamscapes are a reflection of the mutability of the materials, frailty of the image, and fleeting nature of the image. Before each new printing Lindenfeld further works the original etched plate. Creating a landscape in this prolonged way of etching and carving echoes both chemical and physical geological processes, like erosion and the myriad effects of sunlight throughout the day, or between the seasons. Lindenfeld is no longer simply rendering an actual space, but helping to bring a scene into existence with acids, metals, and physical force. In Heidi Neilson’s rooftop series, the artist isolates various pieces of the peripheral rooftop hardware that are such an integral part of our urban visual landscape. As seen from an elevated in Queens, New York, Neilson “presents the rooftops as isolated from the edifice below, through etching methods that use pressure and slippage to emphasize the drifting, uprooted quality of the roofs.” They are adjuncts to a larger structure that is here rendered as an absence. Isolated as images themselves they resonate as independent organisms, clearly displaced from a symbiotic relationship to other organisms. They are outgrowths of the buildings themselves, extrusions of the demands and desires of the organisms within; indeed, they are composite portraits of collective identity. The inferred functions of these objects advertise our needs; their presence announces our presence. Michael Rahn arranges disparate elusive and ambiguous visual elements in varied print media media which float in indeterminate fields functioning alternately as cognitive atmospheres, historical records, and collages that seem to conflate past, present, and future, the real and imagined. 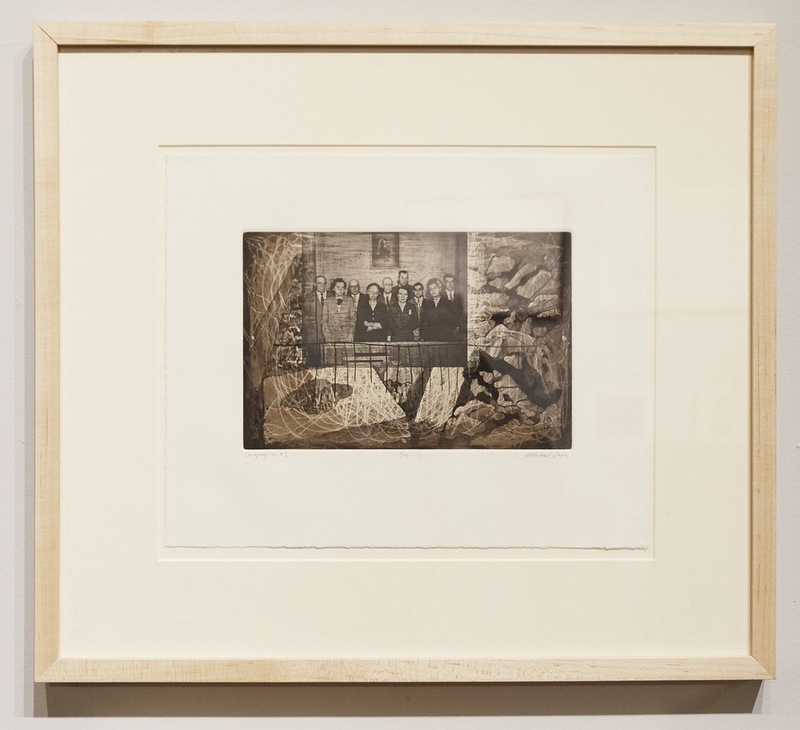 The use of found photographs of an anonymous and cryptic existence allows Rahn to engage in a personal conversations between his own experiences and those of another time and place. Absent of any explicit context, the artist and viewer can engage in a more subjective personal interpretation. These all-over thought-scapes confound time, memory, and traces to suggest narrative while hinting at the universal and eternal. The abstract gestural marks Rahn makes assert the presence of the artist, the hand doing the thinking in a meditative musing on the connections of these elements in time and space. Jewel Shaw creates remarkably beguiling works in which immediately recognizable images share space with elusive forms, vigorous marks, and legible language, to create works that cohere as sublime poems which offering a multitude of subjective readings. Many of her images seem to be glyphs, symbols communicating secrets in a private language that eludes easy translation. Her readily recognizable pictures juxtapose with ambiguously organic figures. Abstract marks seem at once to lead the eye through the work, instructing the viewer how to read the image, but then denying disclosure. All the elements are presented clearly and concisely to be read, a cohesively composed visual poem in a language all Shaw’s own, but without a readily coherent narrative they open to infinite readings. The resulting works breath and pulse with the potential for life like alien transmissions through time and space.